This is the third installment of IN OTHER WORDS, a feature we’re running in 2014 in which we interview various editors on the art of editing. This time, we’re talking to Erin McKnight, Managing Editor at Queen’s Ferry Press and firthFORTH Books. 1/Queen’s Ferry Press (QFP) has a regularly impressive list of forthcoming titles, so I was hoping you’d talk a bit about its genesis—as well as its imprint, firthFORTH (fF)—and how each changed over time. I’m rather proud of the fact that neither the press nor the imprint has changed significantly since inception. I envisioned a forum for collected works and feel that this has been achieved…and bolstered by the publication of writing that redefines fictional assemblage. Novels-in-parts, novella duos, and short-short groupings are invigorating reminders of the niche I’d hoped QFP and fF would carve out in the marketplace. 2/What is your curatorial process like? Beyond the aesthetic overlap between the two presses, is there ever additional collaborative synthesis (e.g., repeat authors, book cover designers, etc.)? I am thrilled that authors published under the imprint have turned around and submitted to the press and vice versa; I’m astonished by their range! There is some design overlap, as what seems to draw potential authors to the press and its imprint is the look of the books—to repeat the aesthetic for their particular title is often appealing. Equally, I’ve discovered some exceptional “outside” talent—writers and designers/artists—through my authors. 3/Name one or two exemplary pieces you’ve published that epitomize QFP and fF on whole. 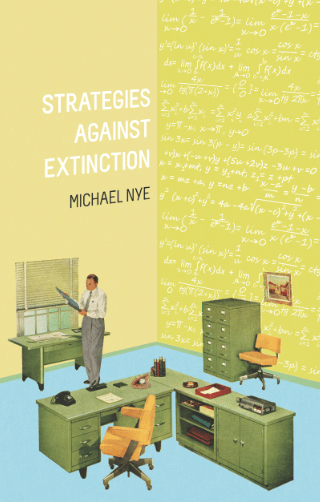 Well, I am of course proud of every title published, but Michael Nye’s Strategies Against Extinction springs to mind as a collection that needed to be published—and that I’m thrilled to have snagged. The stories are mature and measured and the collection offers the kind of realism that stands deservedly apart in a literary landscape that sometimes leans toward experimental, surreal fiction. As for firthFORTH, Berit Ellingsen’s Beneath the Liquid Skin has been well-received as a form of fiction that defies classification: both specific (to an almost scientific degree) and sweeping in scope and setting. 4/Is there an editor or publication that you know to regularly publish solid work, i.e., who do you return to again and again, as a reader? I very much admire Black Lawrence Press; I find myself returning again and again to Yelizaveta Renfro’s A Catalogue of Everything in the World, in particular. The writers and poets published by Black Lawrence are those whose writing I seek out in literary journals. 5. Your flash fiction and non-fiction have been widely published. Does QFP and fF’s aesthetic affect your own writing? I actually now believe that my personal writing led to the inception of Queen’s Ferry Press; other than a little tinkering here and there, I haven’t written much of anything since I started the press—partly due to time and energy constraints, but also because the words of others have proved so fulfilling to me. When it comes to my review writing, let’s just say I am perhaps a slightly more generous reviewer now that I know just how much goes into the finished product! 6. Which of your presses’ upcoming projects/manuscripts are you most excited about? 7. Describe in three words what it’s like to work with you in an editorial capacity. I like to believe I am a collaborative and flexible editor, but must also confess: unrelenting likely also applies. Erin McKnight is the Founding Editor and Publisher of Queen’s Ferry Press and firthFORTH Books. Her own writing has been nominated for the Pushcart Prize and W.W. Norton’s The Best Creative Nonfiction, and her reviews of fiction and poetry titles can be found in multiple venues. Erin lives in Dallas with her husband and young daughter.